If your dog annoys you always by chewing from the furniture edges and also by breaking lot of home goods by jumping here and there on furniture items then it is must to provide your dog a separate residence which would avoid your dog to follow you always especially when you are busy! 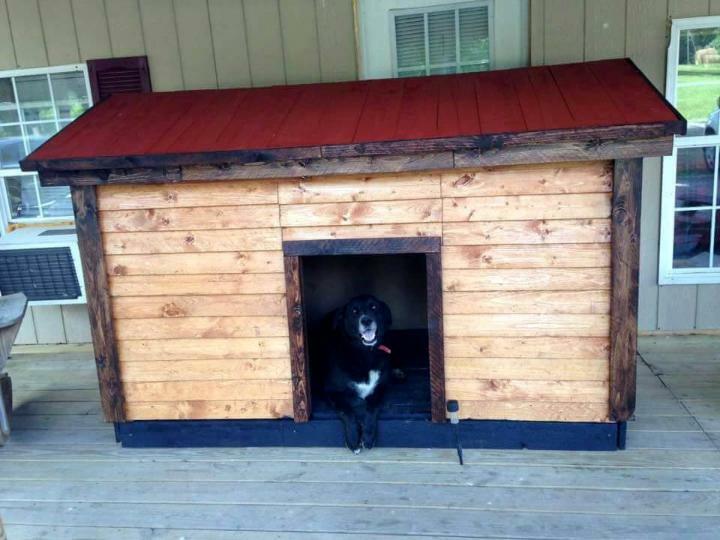 Choose pallets to install an instant and better wooden house for our dog, to make your dog feel special, we are grabbed this beautiful DIY pallet dog house to share with you so you can get an ultimate of your desires by getting inspired of it! 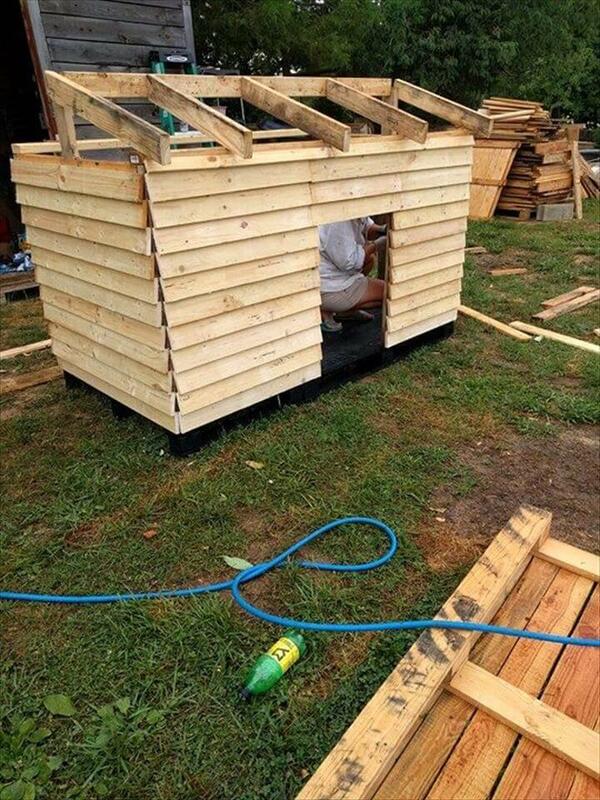 Design of this dog house is all well-built, lasting and beautiful! Finally it has been cladded and given the accent border or boundary lines which appear in dark color for an amazingly gorgeous look of this dog kennel! 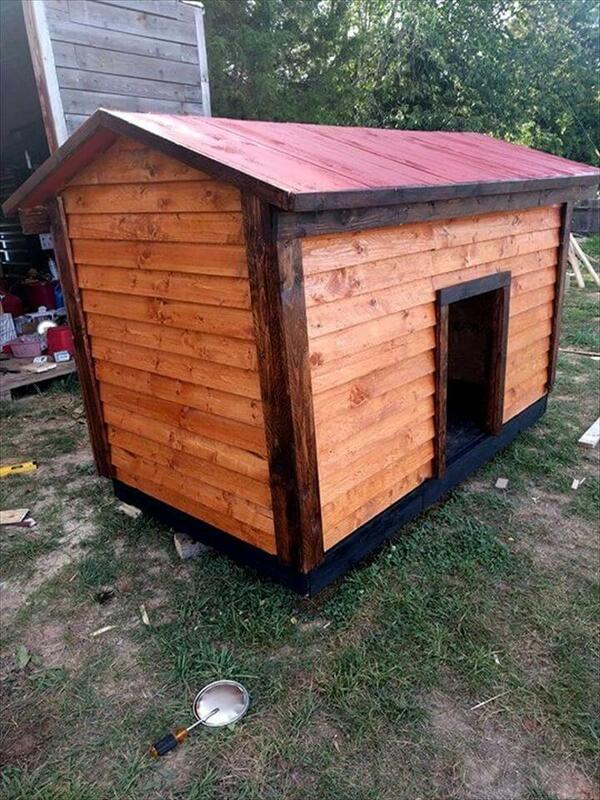 The bottom of this dog house stays well on 2 pallet made floor while top is chevron made straight pallet lengths and has been stained in mahogany for a eye-captivating red tone of wood! 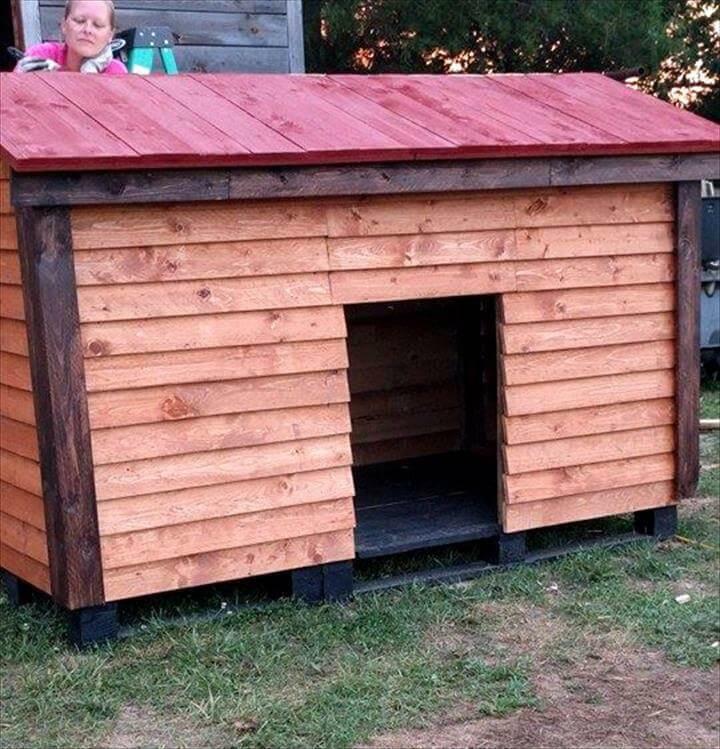 This is here a final dog house output which his having accent black bottom border, a charming brick red chevron roof and an overall solid filled structure! 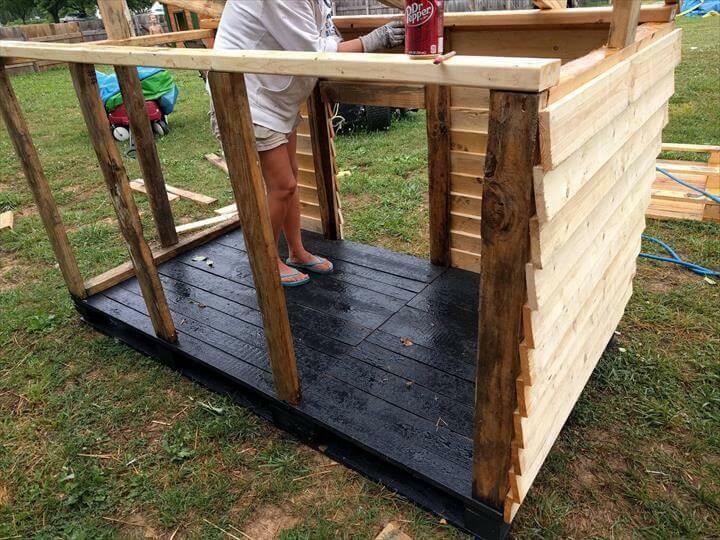 As bottom of the doghouse is to touch the ground so is sure to get dirty or wet which can cause a great damage, so here black stained pallet have been put flat for the floor that will not be weathered so early! On this robust pallet made base, pillars to hold the entire building, have been fixed tight as you can see and also the cross beams! Finally the base frame made of wooden pillars has been made look solid by getting filled with cross alignments of pallet slats as you can see and finally all the walls or complete outside of the dog house has been cladded to look extra beautiful and sturdy! For chevron roof, fix two planks as vertical supports which will hold the main ridge for the chevron roof, now by leaving the equal spacing, install the rafters, learn more from the given preview! Just like the overall building, fill solid the chevron roof too and now the dog house is all completed to house your dog who has been tiered and want to take some rest! 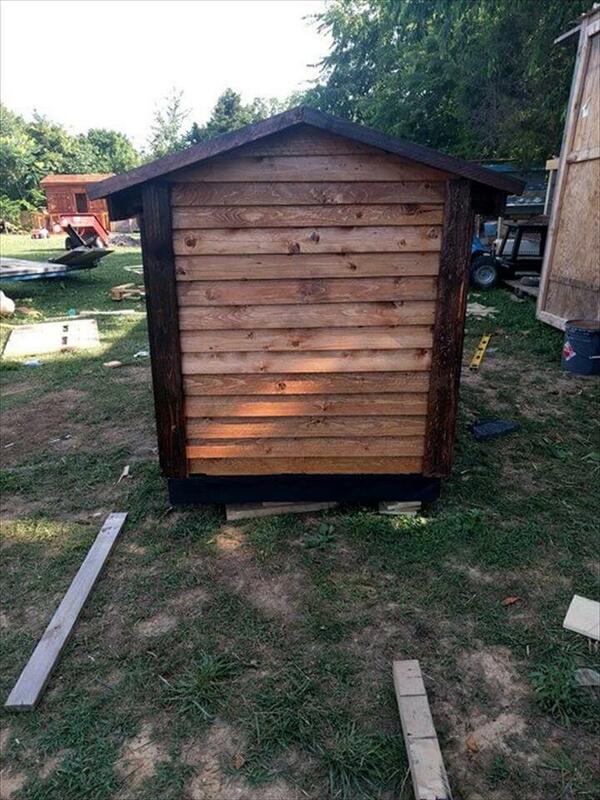 The edges have been made extra stronger by installing extra wooden supports, stained in black! These extra wooden supports to edges also makes the building look more beautiful as they work great as accent boundary lines or outlines to building! 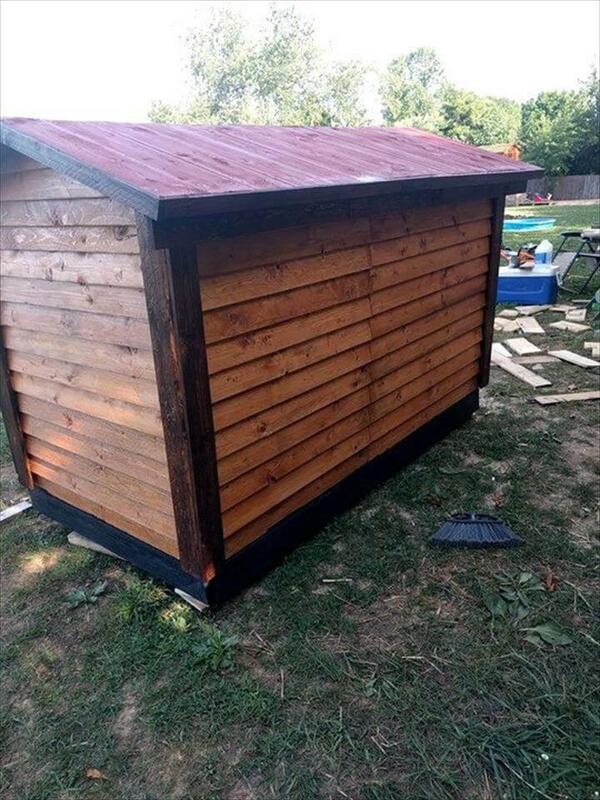 Here it has been decided to give a colorful hue to entire dog house so roof has been stained in red mahogany which makes a beautiful contrast to resting tones of wood! Here is finally finished layout of dog house, has the amazing wooden look enriched with multiple wooden tones, so looks graceful and enchanting! 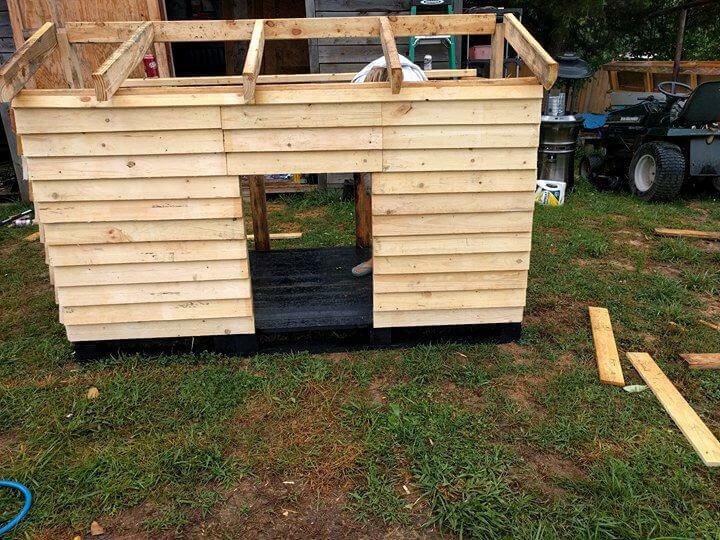 It is here an ever low-cost model of pallet dog house, assembled and fabricated to live last!